Income Tax Returns processing made easy project aim to automate the entire process income tax filing, keeping in the view of database integration approach. 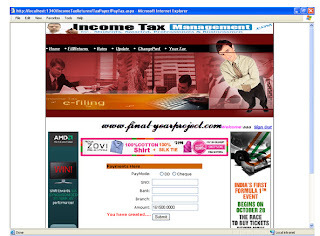 This application will make processing of income tax returns forms faster and easier. This is a ASP.Net based project which uses SQL server at backend. This system makes the overall project much easy and flexible. It can be accessed over the internet. You can also subscribe to our Free Weekly Newsletter by Email for more such projects and seminar. This project consist of 5 modules which are Administrator, Tax Payer, Employees, Authentication & Registration. Administrator is the owner of the web site. He should have rights to accept the registration of the Tax Payers based on their profile. He can change tax rates and add employees. Similarly all other modules are explained the project report with sample code at the end. Currently we are only having project report of Income Tax management project, which you can use for your help and reference purpose.